Suzuki already has the somewhat docile, but fun, GW250 in its line-up, but it lacks a bike to take competitors like Yamaha’s R3 head-on with a more modern, larger displacement engine and chassis sophistication. These patent drawings currently circulating on the Web indicate this may soon change, however. The pattern with other manufacturers has been to introduce a 250cc model first, followed by a larger displacement model in the U.S. and Europe (where the R3 displaces 321cc, for instance). The bike recently announced by Honda, the 2017 CBR250RR, will not be seen in Europe or the U. S. initially, but rumors suggest a capacity hike to over 300cc before those markets are attacked. Suzuki could be expected to follow the same pattern. Perhaps, we will see something from Suzuki in this category at the Fall bike shows. Can Triumph Break the 376 mph Bonneville Record With Daredevil Guy Martin? What I want to see from Suzuki is something that’s not just a rubber-stamp copy of what’s out there already. Same class of bike, yes, but make it different enough that it’s an actual alternative. 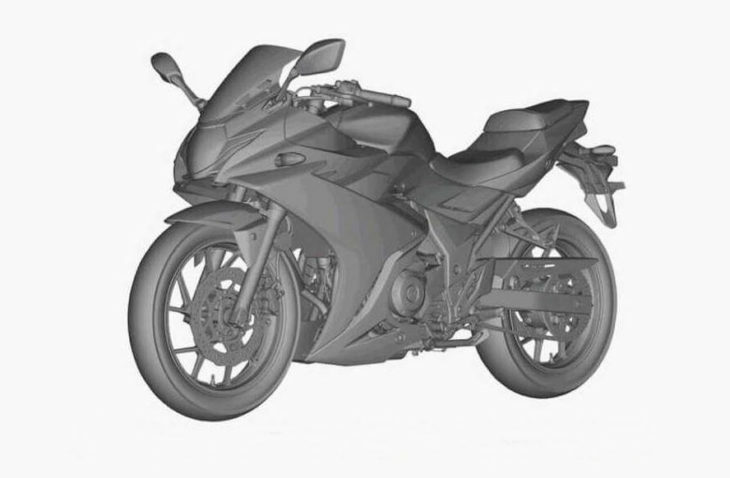 The coming Honda 250RR looks like it has ergos closer to a real sportbike… bravo. The RC390 is funky in its own way. But the R3 and Ninja 300 are so close that you’re basically just buying into the brand and the styling cues. I used to have a little Ninja and have ridden the R3 at a demo day… and to be honest I couldn’t detect any meaningful difference. Give this thing something to really differentiate it… sharper geometry, more aggressive ergonomics, adjustable suspension, perimeter frame, a screamer of an engine (though the Kawi has that pretty well covered)… SOMETHING. Suzuki makes great sport bikes so bring it on. Little bikes are fun. I ride a 300 Ninja and just went on a 45 day tip of 9319 miles. It was great. Isn’t there a super car that does this? Mclaren? The new Acura NSX uses “electron thrust” to fill in for turbo lag, among other duties. Adding motors and batteries to supply them to motorcycles may not work out so good? The 250/350s are all fine and good, but where’s the damn Recursion Suzook has been teasing for for so long? Instead of following in Honda and Yamaha’s footsteps, the Recursion could break them out as an industry leader again. Maybe they’ll have a big surprise waiting for me at AIM Expo this October. Not surprised, but who needs another 250? If that’s what you want, Honda and Kawasaki seem seem to have that niche’ covered. competition is good. improves the breed. Whether there’s room for more models or brands remains to be seen but I see it as hopefully indicating more interest in the sport. In my early riding days there were models from many brands, seemingly covering every 10cc increment from 50cc to 450cc. I loved it, so much variety, something for everyone. I don’t think we’ll ever return to days like that again but I never dislike variety, it can only be a good thing. I’ve toured all over America two-up on 1000 cc and on 250 cc motorcycles and motorscooters. But now I tour solo, so a 250 is more than enough for me. Instead of lusting after the latest new offerings from anyone, I just look at all of the used bikes on Craigslist and Cycletrader, and the many good deals. Amen… just please don’t deter candidate buyers… someone has to first buy them so we can get them cheaper. Motorcycles are getting smaller, scooters are getting bigger, and both are getting too expensive. Has anyone ever seen an SR400 on the road? For $6k they couldn’t add an electric starter. Wasn’t this bike supposed to appeal to older riders? At 61 the only thing I want to kick start in the morning is my heart with a cup of coffee. McDonalds didn’t become the largest restaurant chain in the world by selling expensive food, they did it by selling a “lot” of food. Smaller bikes are great, but smaller price tags are better. If you want a nice bike at an affordable price (specially a Harley), most people are just going to Craigslist. You miss the point of the SR400. It was never intended to be a mass market high volume model. There are other bikes for that which do have the electric start you need. The SR is meant to be the same simple retro bike it was in 1978. They did have to add fuel injection and a catalyst in the exhaust to get it to meet modern emission regs and lost a couple of horsepower for their effort. Some markets did get the second version of the SRX400 and 600 that had electric start and we’re great bikes. They didn’t sell either. The SR400 didn’t sell in 1978 and it hasn’t this time either. It was a dog with fleas then and that dog still has fleas today! I still just cannot wrap my mind around the SR400. Sitting on the showroom floor next to the 390 Duke, asking so much more money and offering so much less bike just blew me away. I get the economics of where the Duke came from vs the Yammy, but why couldn’t the SR be a “subcontinent” bike? At least it could compete with the R-E Bullet. I rode a new SR400, shortly before buying the little Duke and the difference in performance is huge, way beyond just being made for different riding experiences. The SR just falls into a market that I don’t think really exists. As for this upcoming Suzuki, bring it on. I love variety in the marketplace and I hope they bring in something to give the Kwak & the KTM a run for their money. Tyler, the SR400/500s just aren’t bikes that compete with something like the KTM 390s. They are for a better word, cult bikes and have been for a long time. They have continued to sell in small but steady numbers for almost four decades and the sheer amount of aftermarket parts available for them puts them in a different orbit from regular consumer models. in Japan they are a “thing” and I suspect that selling the updated FI model on the world market is a way of keeping the relatively low number production line up and running to keep them available for the home market. Spend some time lurking around the SR500 Forum and your mind may clear up why they appeal to so many for so long. There’s even a lively thread on the ADVrider forum for them where people tour on them. Go figure. “More” or “Less” is not defined by a spec sheet to most consumers. If a product doesn’t look or feel the way they want it to, then there’s nothing in it’s technical specification that will make them change their mind about it. ie. the guy who wants a SR400 would not be any more interested in a Duke 390 than he would a GSXR 1000 or Goldwing. Many riders don’t care about cc’s or hp figures. Bump the displacement to 350. I learned to ride on an old 350. Wouldn’t matter of it were a 350… I’m certain you’d find something else to make it a “deal breaker”. Bravo Suzuki! Just like old times, having all four Japanese at it again. In light of the SV650 resurrection, it’s surely the last edition 1989 2 stroke RGV250RR rising up again. Can 4-cylinder 400cc be far behind…? I think that would be cool but I also doubt it. A four would drive the cost, weight and complexity up. This category would seem to be already very price sensitive. Still, it would be cool to see a modern four. A small I-4 also results in an impractical power output that appeals only to a small population in the segment. Last time they tried it in the US we got the Honda CB-1 & Suzuki Bandit 400. Neat little bikes but ultimately unsuccessful. Twins have historically worked better in this displacement range. May actually be just a stroker kit away? And grafting on two more cylinders while they are at it. The current (USA) GW250/GW250F is a fuel-injected 248cc parallel twin. The photos only look like slightly tweaked, sportier (the GW is more of a “standard”) body work from the current model. I would say no, they would not get into RR area. Suzuki may have been the most risk averse of the Japan big 4. That is because of their previous excursion into the RE5, which almost bankrupted the company. It was explained to me, that after that fiasco, Suzuki would watch markets, and only then decide which bike to make, with the intention of already having a target to shoot for, and create something of superior design. Suzuki is a small company. The RE5, I knew that Suzuki did a rotary but never knew it meant so much problems to them, thanks for the history! I find that hard to believe since it would put them perpetually behind the rest of the market by about 5 years. Sadly, lately, yeah. Remember the original GSX-R? The original GSX-R probably represent Suzuki’s golden era, it was THE BIKE to have; the original GSX-R 600 it’s still recognized as an overall good machine, kinda of Suzuki “Honda Hurricane” as in it can do everything. 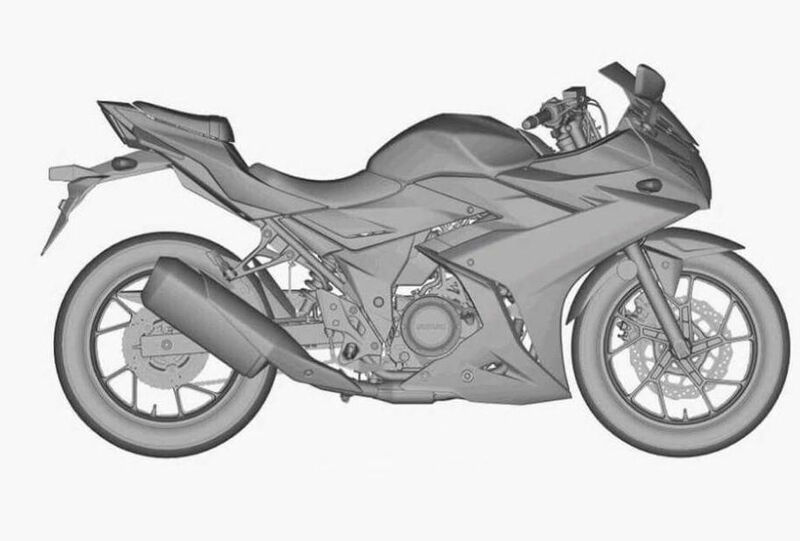 We will probably get another thousand bikes based on the same castings of the 1000 and 650 L twin castings and “original and detuned” Gixxers… which in my book is fine. Comments are going weird or there is a bug on storing and retrieving them…. Their old GZ250 was a single with two exhaust pipes. Can’t always tell from that. I’d rather see a TU500 (with tubeless tires). Can we be sure that’s a twin? It looks like they were careful not to clearly show the exhaust pipes (pipe).